York Cares’ seventh annual Big Community Challenge has been and gone. Over 175 employee-volunteers headed to Tang Hall Community Centre, alongside students from University of York and Tan Hall Primary School. Together, they undertook the huge task of transforming and reinvigorating the grounds of the centre, creating a community hub where people can garden, socialise and celebrate together. The centre aims to be a community hub for social enterprise and social inclusion, working with the people of Tang Hall to help fulfil community priorities and promote Tang Hall as a good place to work and live. Volunteers came from all across York and beyond. We had volunteers from Aviva, ADVA Optical, Benenden, City of York Council, Evora Construction, First York, John Lewis, Langley’s, Nestle, North Yorkshire Police, Northern, Portakabin, Sainsbury’s, Tang Hall Primary School, TSP, The Partners Group, University of York, Waitrose and (last but certainly not least) Yorkshire Bank. On top of this, we received generous donations of plants, food and building materials from Evora Construction, Homebase, Johnson’s of Whixley, Mitchell’s Landscapes, Portakabin and Waitrose. When we first arrived on Monday morning in the pouring rain, I wasn’t sure whether we’d be able to achieve everything that we wanted to. However, every single volunteer went above and beyond and really showed what people can do when they work together. 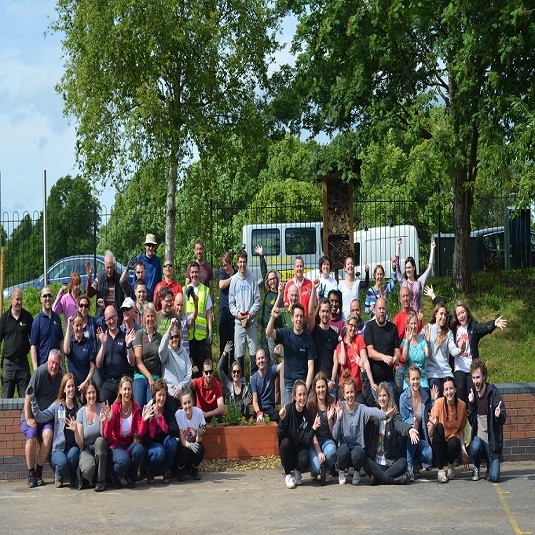 We absolutely smashed all of our targets and made a real difference to the outdoor space at the centre. Our volunteers transformed the under-used basketball court into a multi-purpose outdoor community space, complete with a beautiful new seating area. Employee-volunteers created raised beds and a composting area to help the centre with their aims to reduce food waste in York. Volunteers repainted and totally revamped a well-used playground as well as dismantling and removing condemned play equipment. Volunteers were also able to destroy a condemned, wholly unsafe set of stairs and transform them into a lovely grass bank. Being able to go in every day and see the transformation unfold before my eyes was incredible. I feel so honoured to have been able to play a small part in it. Anyone who was at the BCC will remember me as the girl asking to take everyone’s picture. I was proud to be able to use social media to celebrate everyone’s amazing achievements and increase awareness about all the hard work everyone was doing. It makes me so happy to live in York knowing that so many people want to make a difference and want York to be the best that it can be. Speaking on behalf of York Cares, I would like to offer another huge thank you to everyone that got involved – you all made such an amazing difference.